10s of thousands hold place on Lusavorich Street as military troops and armament are called to the scene. ArmeniaNow reporters on the scene at the French Embassy say that police have left the site. Some there say the police have “fled”, after facing the overwhelming crowd that has grown to tens of thousands or more. Members of the crowd vow to stay there until Levon Ter-Petrosyan joins them. The oppositionist candidate is effectively under house arrest, as police have surrounded his home since early this morning. 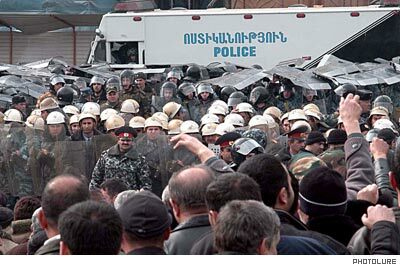 The crowd outside the embassy has been joined by former oppositionist presidential candidate (2003) Stepan Demirchyan.